Cheekwood and Vanderbilt’s Center for Latin American Studies partnered for this day-long teacher workshop featuring Vanderbilt University Department of Anthropology scholars presenting on themes of food, community, and Day of the Dead traditions in Latin America. 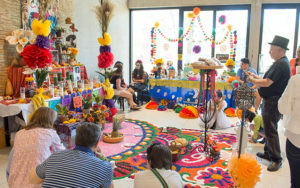 Participants built their own Day of the Dead altars with personal ofrendas during a hands-on activity that can be implemented in the classroom. [travel scholarships available] *Free for pre-service teachers! Contact Colleen McCoy [colleen.e.mccoy@vanderbilt.edu] for more information.